Anyone who has been a county commissioner for 16 long years has a history. One's own political history is the best predictor of what one will do in the future, not campaign rhetoric. Therefore, what does one do when their political history includes growing local government, ballooning the bureaucracy, blowing out future Community Investment (CIT) revenues, pushing for unnecessary massive tax hike boondoggles - multiple times - and pursuing a billion dollar baseball stadium to subsidize and enrich another wealthy sports team owner? They try to rewrite their own history. Today we can clearly see the "Three Faces" of Hillsborough County Commissioner Ken Hagan. Two of the faces reflect Hagan's actual past history. The third face is Hagan's self-described campaign rhetoric in his campaign mailers trying to rewrite his own history. Hagan even used a picture of him and Gov. 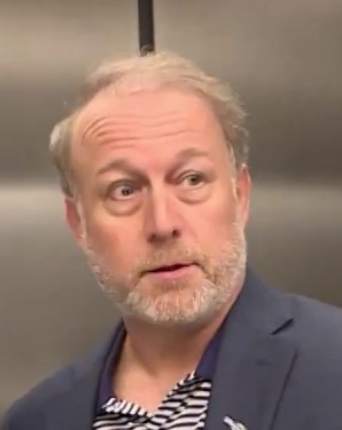 Scott from 2012 without Scott's approval. Isn't that illegal or at least unethical? Ironically, Gov. Scott touts the need to get rid of career politicians - that includes Hagan. Fiscal conservatism includes lower taxes, less spending, less debt and smaller government. While Hagan self describes himself as "conservative" in his campaign rhetoric, let's review some history. Most of the property tax millage rate cuts Hagan touts were made during the housing bubble. Property tax revenues were flooding County Center from escalating property values and new growth while property owners were getting angry about the increasing property taxes. Floridians were so angry about escalating property taxes that the state legislature passed a bill in 2007 to roll back property tax rates to 2006 levels and mandated deeper cuts based on how much a local government collected in property tax dollars. In addition Amendment 1 was overwhelmingly passed by voters in 2008 64-36% that added an additional homestead exemption, the portability of Save Our Homes benefit and an assessment cap on non-homesteaded property. Hillsborough County has one of the highest median property taxes in the United States, and is ranked 376th of the 3143 counties in order of median property taxes. Then the recession hit in 2008 and the county had created its own big problem. It had ballooned the bureaucracy, was blowing thru county tax dollars like a drunken sailor and wrongfully assumed the housing bubble would never burst - aka bad judgment. The county was then forced to make cuts to balance the county budget. Where did the county decide to cut? Transportation - which is a primary responsibility of local government. Transportation funding got a double whammy hit with the recession under Hagan's tenure. The county diverted ALL property tax revenues previously funding transportation to other places to balance the budget. In addition, the Community Investment Tax (CIT) funding for transportation evaporated because the county had gone on a huge debt spree of borrowing against future CIT revenues right before the recession hit. In 2007, Hagan, who led the Transportation Task force, and then county debt/bond manager Mike Merrill recommended the risky huge borrowing against future CIT revenues - just 11 years into the 30 year tax. This broke the promise the county made to spend the CIT revenues in 5 year increments as part of their 5 year Capital Improvement Plan (CIP). Merrill told the commissioners in 2007 that the CIT tax would continue growing leaps and bounds and CIT revenue growth would be so great there would not be any problems funding future needs. Such bad judgment. Everyone else knew the housing bubble was going to burst at some point. The borrowing spree tied the hands of future commission Boards for years after the recession hit. And Surprise! In 2007 Hagan's close PR confidante Beth Leytham was hired and paid with county tax dollars to be a consultant to his Transportation Task Force. Sound familiar? When the county commission voted in 2009 to fire then county administrator Pat Bean, it was Hagan who recommended and lined up debt manager Mike Merrill to replace her - promoting the person who had provided such bad judgment to blow out future CIT monies. THE SECOND PHASE, WHICH WILL BEGIN IN THE FALL, WILL FOCUS ON LONG-TERM SOLUTIONS, WHICH PRIMARILY INCLUDE LIGHT RAIL OR COMMUTER RAIL OR RAIL OF SOME FASHION. Three years later when the unemployment rate in Hillsborough County was running 10-11%, Tax Hike Hagan voted at the May 13 2010 public hearing to put the multi-BILLION dollar rail boondoggle sales tax hike on the 2010 ballot. While many Hillsborough County residents were still hurting and struggling from the recession, Hagan decided it was time to put a sales tax hike on the ballot. Hagan was Chair of the county commission in 2010. Again - such bad judgment! The multi-BILLION dollar tax hike was not conservative and certainly showed no compassion for those still financially reeling from the recession. Thankfully it was overwhelmingly defeated because it had a basic 3rd grade math problem and was a bad plan. Tax Hike Hagan's pursuit of huge tax hikes and his alter ego District Rays Candidate Hagan's pursuit of a billion dollar baseball stadium have been a package deal for almost a decade. As we reported here, Hagan invited the baseball coalition to speak at the May 19, 2010 BOCC meeting immediately after he had voted to put the rail tax on the November ballot. The tax hike came back courtesy of the crony Go Hillsborough (GH) campaign in 2014 as Hagan was heading toward his second countywide term. The District Rays Candidate Hagan saw his stadium clock ticking away. His alter ego Tax Hike Hagan knows he needs a new funding source to pay for a billion dollar stadium and he saw the GH tax hike as the ticket. After getting the Parsons/Leytham team in place for the GH tax hike by August 2014, District Rays Candidate Hagan began actively pushing the baseball stadium issue. By January 2015 with the tax hike GH campaign underway, District Rays Candidate Hagan and his alter ego Tax Hike Hagan had his baseball and tax hike agenda both lined up. The District Rays Candidate Hagan had gotten his secret baseball committee created and got the county to hire an expensive NY baseball law firm Foley and Lardner to negotiate with the Rays. The GH Parsons/Leytham team had to propose another 30 year tax hike because that was always part of the phony campaign. In the middle of the GH community meetings, Tax Hike Hagan came out supporting a tax hike. Tax Hike Hagan voted for the unnecessary 30 year, $7 BILLION tax hike at both Go Hillsborough public hearings in 2016. Apparently Hagan's "when you cut taxes, you ignite job growth" slogan is his lip service and meant only for his campaign flyers. Tax Hike Hagan held local road funding hostage for almost a decade while he pursued multiple massive county tax hikes for trains. 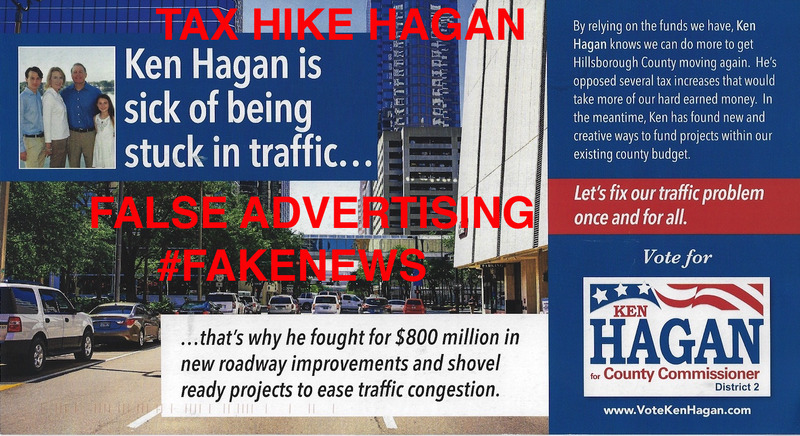 This #FakeNews flyer of false advertising reflects how Tax Hike Hagan will say anything to get elected. District Rays Candidate Hagan is now pursuing some creative public financing scheme scam to fund the billion dollar baseball stadium. Incurring another huge round of debt putting taxpayers at risk to subsidize a wealthy sports team owner is not conservative or fiscally responsible. Who should you believe - Hagan with a history of bad judgment or Economists? "The idea that sports is a catalyst for economic development just doesn't hold water." When surveyed, 86 percent of economists agreed that "local and state governments in the U.S. should eliminate subsidies to professional sports franchises.. In a 2017 poll, 83 percent of the economists surveyed agreed that "Providing state and local subsidies to build stadiums for professional sports teams is likely to cost the relevant taxpayers more than any local economic benefits that are generated. The history of District Rays Candidate Hagan and his alter ego Tax Hike Hagan is pushing massive unnecessary sales tax hikes and risky financing schemes and pursuing a billion dollar baseball stadium. Words on his campaign flyer are just rhetoric to get elected. The District Rays Candidate Hagan and his alter ego Tax Hike Hagan's donor base, who cannot even vote for him, (from his campaign filings with the SOE) is who he is beholden to. After 16 too long years as a career county commissioner, Hagan is running again for a single district seat he already held. He is doing what no other commissioner has done since Hillsborough county's Charter was implemented in 1983 - violating the intent and spirit of the term limits in the Charter. There are Three Faces of Hagan: Tax Hike Hagan, District Rays Candidate Hagan and Hagan's self-described [false] narrative of "Conservative" Hagan. But the Three Faces of Hagan have a Primary challenger, Chris Paradies. That provides an opportunity for voters in District 2 to reject all Three Faces of Hagan in this months Primary.